Quantum Fitness treadmills came about in 2004 from a company which had been making weight training equipment for both the physical rehab market as well as the health clubs and corporate wellness centers since 1990. Based in Houston, Quantum Fitness remains better known for their commercial abdominal machines which you might have seen at your local health club. The company feels they can make their presence known in the cardio equipment field which is why they launched their signature “Q” series treadmills. Their motto (above) reflects their business goal of producing high-end machines yet maintaining value and low costs. 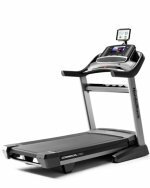 Ranging from $1,999 to $3,299, Quantum Fitness offers treadmills that include a strong warranty (10 years motor; 3 years parts), large 2.5” OD Rollers, a max 375 lb user weight, and an easy-to-use console. UPDATE: Quantum Fitness is no longer making treadmills and they are not available for sale. For similar quality take a look at TRUE treadmills, with numerous Best Buy picks in the category. 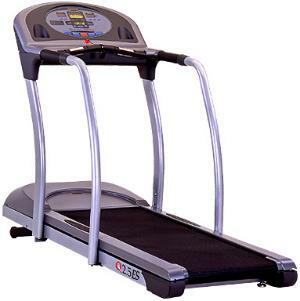 Despite the shorter running surface (22" x 54"), the models come with over-sized handrails which are ideal for seniors or those in rehab who need a good walking treadmill offering this type of safety feature. And we think that burl wood grain dashboard on the custom console is very 50s Retro! Quantum treadmills score slightly above average in reviews. They get their best marks for the good warranty, as well as for cushioning and the size of the walking area, but then those are the things you want on any machine so it’s not much of an endorsement. Other than that, treadmill reviewers give these treadmills average scores for quality, reliability, and noise. These are good machines, but once you’ve gone past the $2,000 price mark for a treadmill you might as well buy the best. Quantum isn’t it. The lower end models are just okay, nothing spectacular, but the high-end Quantum Fitness treadmills don’t hold a candle to industry leaders such as Lifefitness, True, Precor, Bodyguard, and Landice. Quantum Q-3.1 ES - Rehab-oriented features provide secure exercise experience for the less-than-fit user. Used in health clubs, hotel chains, and by pro athletes. Quantum Q-3.2 EX - A rock-solid, elegant looking model based on a medical rehab machine; accommodates larger users or those with special ambulatory needs. Quantum Q-3.3 ESD - A high-end commercial treadmill with large 2" OD handrails, low step-up floor height and rehab-oriented features; used for medical stress testing.